Destined to hold the title of the world’s tallest structure, the Kingdom Tower is envisioned to become the leading beacon of business, leisure and open the door to a futuristic metropolis. Reaching towards unprecedented heights, this landmark is the shining point intended to place Jeddah on the global arena, setting new levels of business, accommodation, and community lifestyle. With the turn of the 21st Century, dynamic challenges and competition in an ever-evolving world continue to redefine modern communities arising from fading old ones. For this purpose, innovation, cutting-edge architecture, luxury and sharp vision have been molded together to bring about the Jeddah Tower, designed by leading Architect Adrian Smith. Located in the Northern part of Obhur, The Jeddah Tower stands tall amidst the majestic Jeddah Economic City, amassing a complete set of amenities ranging from Business facilities, offices, a grand hotel, commercial shops, residential spaces, parks and much more, with a vast shopping area. While the Jeddah Economic City is envisioned to overlook the Pearl of the Red Sea, the Jeddah Tower’s mega height is intended to overlook much more than the eye can see, at a height of over a kilometer, and sporting the world’s highest observation deck. With a clear leadership vision in mind, Jeddah Economic City is willing to reflect its pioneering ambitions through the Jeddah Tower, becoming the new wonder of the world, and embodying the overall renaissance of Jeddah City, while embracing the commercial legacy this city has had for thousands of years. 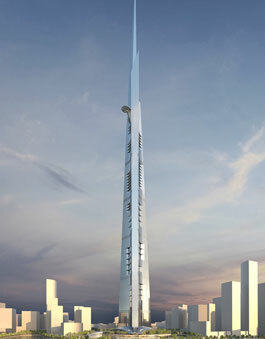 In addition to its staggering height, the Tower will be surrounded with the fabulous Jeddah Tower Waterfront District, a stunning area that combines breath-taking settings and landscapes that nurture a euphoric feeling to pedestrian life and an intelligent transport matrix that connects the path to and from the Tower towards the carious districts and areas surrounding it. Providing the Tower’s connection among its stories are 59 elevator systems divided between single and double-decked units for convenient movement among floors and levels, leaving a memorable experience every time. When entering the Tower through its main lobby, you will be mesmerized with what is in store for your unique experience by the Tower’s amenities. The ground level lobby is the gate that interweaves the various paths towards the multiple tiers that constitute the Tower’s stature, as well as brings about the architectural beauty of the towering wonder from the inside. With impressive architecture and spacious interiors covering more than 6,000 square meters. Through the astounding halls, the lobby offers several passages through elevators and transport mechanisms that lead its visitors and residents alike to the different areas engulfing the inner spaces of the Tower. If you would like to retain a catalog of the Jeddah Tower, learn further in terms of stats, facts and figures, as well as view conceptual artwork, feel free to download our e-brochure.